The gothic building Grote of Sint-Laurenskerk was completed in 1525. During a German bombardment in May 1940, the entire interior was lost to fire. Restoration of the church was undertaken following the war in the years 1947-68. The first church building had a large Goltfuss organ from 1644, which was replaced with another instrument in 1790 (enlarged by Bätz in 1845). The destruction of this instrument was total, and so a new main organ was supplied by the Danish firm Marcussen & Son in 1973. (Two other smaller Marcussen instruments can be found in the church as well.) It is a large neo-baroque instrument that is completely mechanical in all respects. It is the largest entirely mechanical action instrument in Europe. 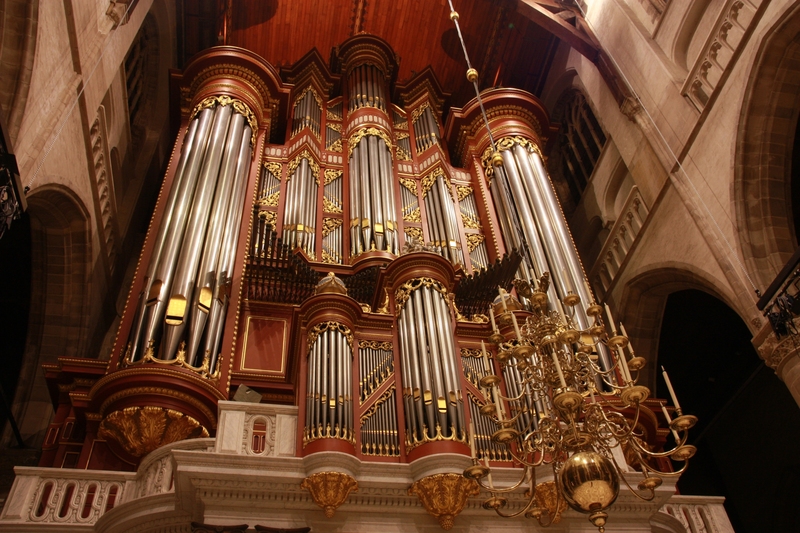 The organ consists of six divisions and contains 85 speaking stops. One unusual feature of the instrument’s design are its multi-rank principal stops. Most all of the principals and octaves (16′, 8′, 4′) of all divisions are comprised of more than one unison rank.